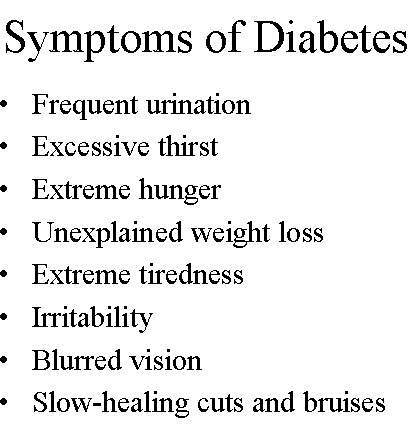 There are a range of symptoms that may be suggestive of diabetes, including excessive thirst and tiredness. 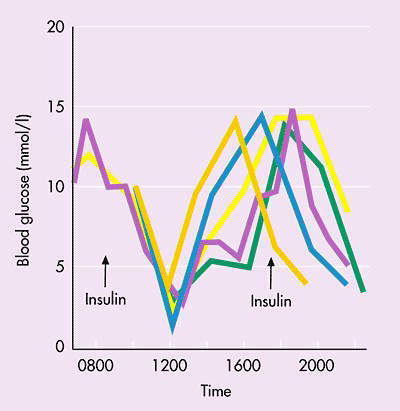 Typical day-to-day patterns of blood glucose levels in several individuals. Risk factors for diabetic complications. 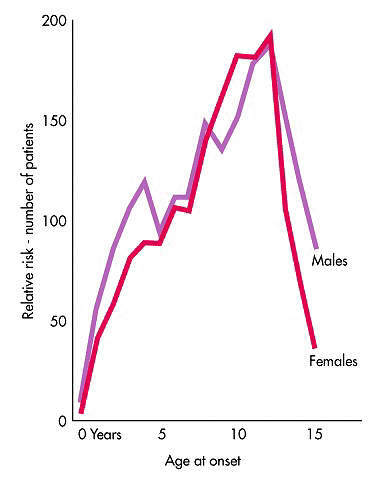 Age of onset of type 1 diabetes, formerly known as insulin-dependent diabetes. 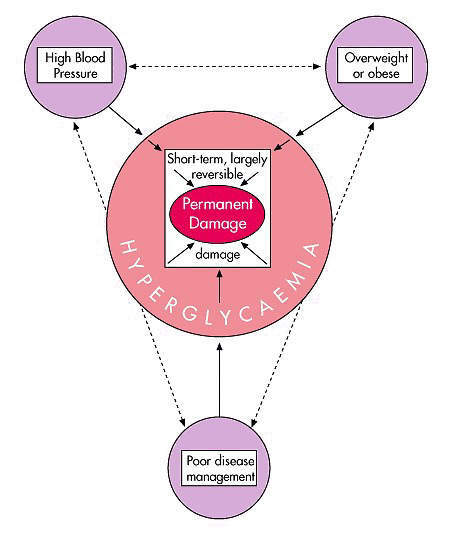 Management of diabetes requires not only good glycaemic control but also control of blood pressure and blood lipid levels. 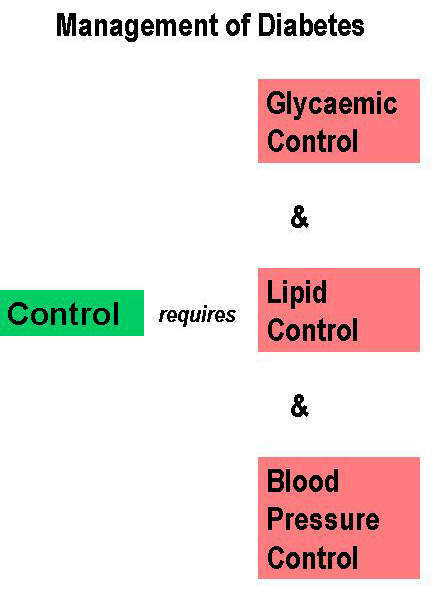 Effective control significantly reduces the risk of diabetes-related complications. Type 2 diabetes accounts for the vast majority of cases. Oral-Lyn is an oral spray formulation of human insulin indicated for the treatment of type 1 and 2 diabetes. It is being developed by Canadian company Generex Biotechnology. 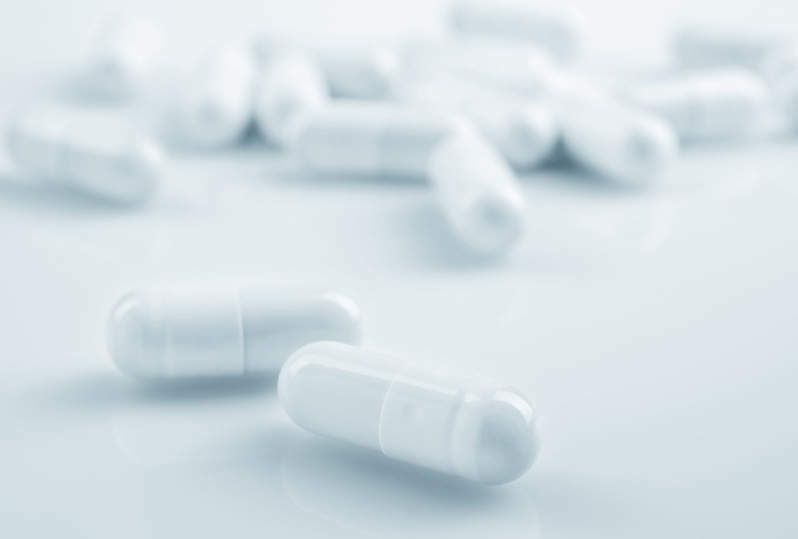 Having secured regulatory approval in 2005 for clinical use of Oral-Lyn in type 2 diabetics in Ecuador, the company was keen to progress phase III trials in the major North American and European markets, where it hoped to achieve comparable success. Phase III for Oral-Lyn in North America was made on 7 April 2008, beginning with patient screening. The first screening was carried out in Texas in late March 2008. Other clinical sites taking part in the study are located in Maryland, Minnesota and California in the US, and in Alberta in Canada. In September, 2009, the US Food and Drug Administration (FDA) approved Oral-Lyn under its treatment investigational new drug programme. This programme enables companies to provide access to drugs which have not been approved and are under development to patients suffering from serious diseases. Such approvals are only granted after a drug has demonstrated its efficacy in clinical studies and when no other significant alternative treatment is available. Diabetics who require insulin to keep their blood sugar levels under tight control (target HbA1c levels of less than 7%) have to administer it by injection. The need for regular daily injections is a major drawback for diabetic patients and can reduce compliance with treatment. oral formulations for buccal delivery. Generex’s Oral-Lyn is a liquid formulation of human insulin that is sprayed into the mouth using its proprietary RapidMist device. In the mouth the insulin is absorbed via the buccal mucosa, an area with a rich vasculature. Generex believes that Oral-Lyn will provide an effective alternative to prandial insulin injections and improve patient compliance with insulin therapy. Approval of Oral-Lyn by the Ecuadorian Ministry of Public Health was based on data from clinical trials conducted in Ecuador that involved more than 250 patients with type 2 diabetes. These studies showed that Oral-Lyn had comparable efficacy to prandial insulin injections in this patient population. Generex is hoping to extend use of Oral-Lyn in Ecuador to type 1 diabetic patients and has already initiated a six-month study of its safety and efficacy in adolescent and young adult patients with the condition. An earlier short-term study, in which Oral-Lyn was compared with short-acting subcutaneously injected pre-prandial insulin (Humulin), was considered successful. In this study Oral-Lyn was taken both before and after each meal. The real test of the product’s viability, however, will come from large-scale trials involving several thousand patients that will be required by regulatory authorities in North America and Europe. On 6 August 2008, Generex received approval to conduct an Oral-Lyn trial on patients diagnosed with or prone to developing impaired glucose tolerance. The approval was received from the Ethics Committee at University Campuse Bio Medico, Rome. The study was to help determine whether the glucose levels of patients drop when they are using Oral-Lyn. On 11 March 2008 Generex announced that the labelling and packaging of canisters for Oral-Lyn had been completed. The canisters were produced for the ongoing Phase III clinical trials in the US, Canada and Ukraine. Phase III trials are also being carried out include Russia, Romania, Bulgaria and Poland. Estimates from the World Health Organization suggest that at least 150 million people have diabetes and that type 2 accounts for the vast majority of cases. Worldwide, the costs associated with the treatment of diabetes and its complications are estimated to exceed $200bn a year. Adverse lifestyle changes which have seen an explosion in the incidence of obesity, an important risk factor for type 2 diabetes, are contributing to the continual rise in the number of new cases that occur each year. By 2025, prevalence of diabetes is expected to have more than doubled from today’s figures. Diabetes can lead to serious complications if left untreated or poorly controlled, such as retinopathy, cardiovascular disease, nephropathy, neuropathy, peripheral vascular disease and premature death. Insulin injections revolutionised the treatment of diabetes when first introduced into clinical practice in the 1920s. The advent of non-injectable insulins, such as Oral-Lyn, has the potential to be just as revolutionary and to make regular insulin therapy much more acceptable to diabetic patients. In addition to all type 1 diabetic patients, for whom insulin is essential therapy, there are about 40-50 million type 2 diabetic patients who also need insulin to control their blood sugar levels effectively. However, the thought of having to self-inject several times a day leads many patients to fail to take their insulin treatment regularly, exposing them to the risk of diabetes-related complications. Insulin therapies have evolved over recent years to include rapid-acting insulin analogues, analogue mixtures and long-acting insulin analogues. Non-injectable insulins are now poised to enter the market, with analysts predicting that these new insulin formulations could achieve sales in excess of $5bn by the end of the decade. Generex has received approval for commercial sale of Oral-Lyn in several countries. In India, approval was obtained in November 2007. The first commercial order was made by Generex’s Indian distributor Shreya Life Sciences in March 2008 for 210,000 canisters of Oral-Lyn. On 1 April 2008, Generex signed a licence and distribution agreement with SciGen. Under this agreement, SciGen will acquire approvals for importing, marketing, distributing and selling Oral-Lyn in China, Hong Kong, Indonesia, South Korea, Malaysia, the Philippines, Singapore, Thailand and Vietnam. SciGen will use its own recombinant human insulin product for the sale of Oral-Lyn in these countries. On 14 May 2009, Oral-Lyn was launched in Lebanon by Benta SAL. It is available on the market as a box containing one canister and one actuator. The canister contains 400IU of recombinant human insulin, while an actuator is a device that is used for managing the drug.